The review you see below will be slightly different than what I’ve done in the past. It’s a review of a short story I read in an anthology. This means, that while I’ll be reviewing the story, this is not a full review of the anthology and won’t be on Amazon, Goodreads, etc. I’ll only post full reviews on those sites as those are meant for the full books. When I finish the rest of the stories, a full review will be written up, as well. Hope this little glimpse into the anthology grabs your interest. This was a good story and had a nice twist to it that I didn’t expect. 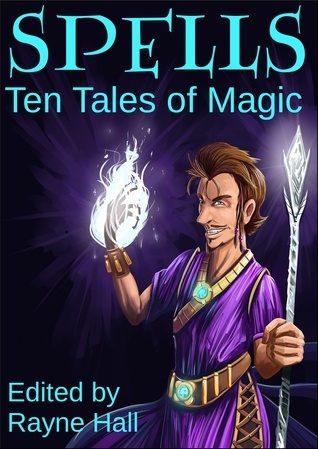 Being unfamiliar with Ballintyne’s writing, I decided to start reading this story from the Spells anthology. It turns out they even in the short form the author was able to give enough insight into this fantasy world to keep my interest. With the description mentioning that the magic of this world is in the music, I was intrigued. What the reader gets is a story in which a great disaster is set to occur due to a theft. But behind the simple premise are a few deeper elements that were made with well-developed characters (for it being a short story), just enough background story, good world-building, and a fun form of magic: singing/music. As I mentioned, I didn’t expect the story’s outcome. This always raised my level of enjoyment overall in a story and makes me want to read more of Ballintyne’s work if she has more to release in the future. I also now want to see what the other authors of this collection have to offer. This entry was posted in Review and tagged Anthology, Ciara Ballintyne, Collection, Fantasy, Magic, Music, Review, Short Story, short story review. Bookmark the permalink.